If you want a Stunning Ocean View from a truly impressive, fully furnished beachfront condo, this is it. 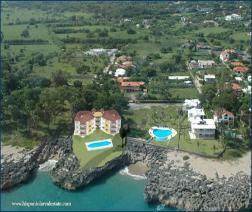 For the discerning taste this residence is safe, quiet, convenient, and ultra-nice.In Sosua but out of the noise this one is convenient with class. 10 units, Gorgeous, Your Corner of Paradise. ▪ •Elevated Front Row Views of the ocean, mountains, and spectacular Sosua oceanfront are simply unmatched. ▪ •Spacious, well appointed condo fully outfitted. ▪ •Access to pool and decking from dining area but also has a large private patio that opens to the den and bedroom with amazing views and even some private yard. ▪ •Everything you want, beautiful hardwood everwhere, granite, tiled backsplash and lovely floors and talk about windows and glass doors--everywhere! •Storage everywhere including a walk in closet. ▪ •Coral stone wall accents throughout the apartment are beautiful. •You get it; this one is nice and very safe, quiet. •I'd live here in a minute! ▪ •Private laundry off the kitchen. •Of course air conditioning and ceiling fans but you'll get ocean breezes all the time.